What are Vinnies 4 Life Bespoke Totes? 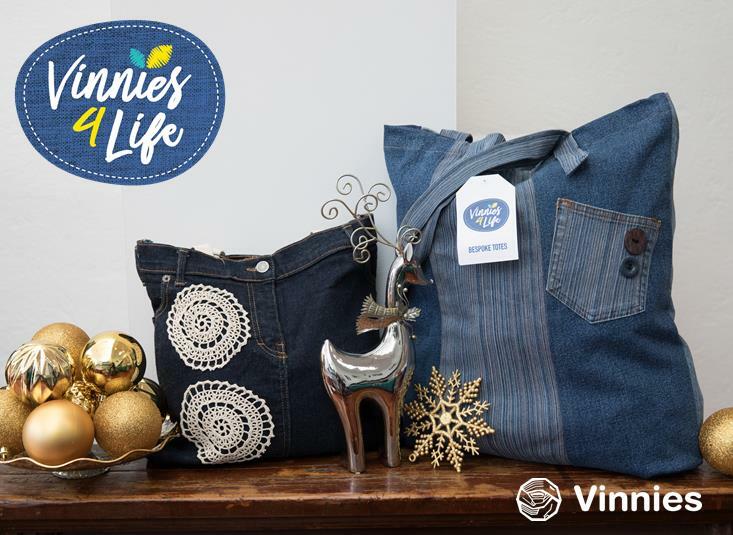 Vinnies 4 Life Bespoke Totes are one of kind bags made from donated textiles, clothing or accessories that would usually go to rag or landfill. The Bespoke Totes are made by Castlereagh Industries, a business unit of the St Vincent de Paul Society, by a small number of makers. The price tags feature a story and picture about the employee who made the bag. These people are supported employees with disabilities, living and working in regional NSW. Making the bags provides meaningful and creative work opportunities for them and provides the Supported Employee with an opportunity to develop valuable work skills and attain accredited training, expanding their personal and career aspirations. How are the bags made? The totes are all made by hand and each bag is unique. The makers identify different fabrics and piece each design individually, using various accessories and embellishments that are available. Employees perform various tasks such as identifying suitable fabric, cutting patterns, removing patches, buttons, pockets etc, piecing together the bag and finally sewing the bag. There are two prices as there are two different styles of bags. The basic tote bags are $19.95 and the premium tote with extra embellishment are $29.95.